Between the 10th and 15th of March a group of sculptors and performance artists put together a unique installation piece in Vienna. 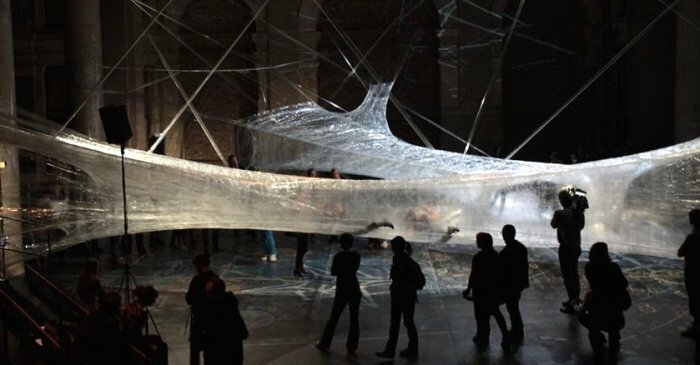 While primarily meant to be a stage for the dancers the installation of a giant spider-web style structure in the middle of an abandoned stock exchange building has drawn a lot of interest. The artistic collaborative group "Numen/For Use" created this structure from 530 rolls of packing tape. Their website says that was 35,600 meters of tape weighing in at 45kg. For those of you who are not metrically inclined that is 116,797 feet and 99.208 pounds. Just because I liked word problems in school that means that each roll of tape measured 67.170 meters (220.372 feet) and weighed 84.905 grams (2.995 ounces). To further investigate the tape usage I decided to check out the most common tape lengths available and see what kind of comparisons we could make with the packing tape commonly found around the office. 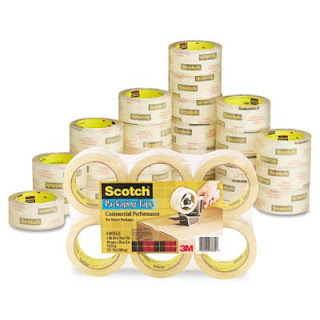 The most common packing tape by far is the Standard Scotch Packing Tape on a 165 foot roll. Now a 165 might seem like an odd number, but that's actually close to 50 meters, which is a nice round number. That means it would have taken 712 rolls of standard Packing Tape to create this monstrosity. If you are ready to start on your own path to Packing Tape structure building I'd recommend you start with a huge pack of Commercial Grade Packing Tape. This is 3Ms toughest, thickest packing tape so when you are creating structures to hold dancers it is a worthwhile investment. The standard pack only comes with 48 rolls, but unless you have an abandoned stock exchange building to build in you should be okay. This pack of tape will only get you roughly 7% of the way toward your own Vienna Semitransparent Spider tubes, but everybody has a beginning. What Do We Use Rubber Bands For? A Fridge That's More Than Meets The Eye.